This is a premium enclosure netting to be attached onto the front of 14ft round trampoline Enclosure. It is able to totally enclose the kids, the teens or the adults and provides protection against bouncing out of the mat and contact with the frames. Just replace your old and worn-out netting with this brand new one! Start a new era of bouncing and having fun together! Features: Brand New in Box Ready to Be Installed. Soft Mesh, UV stable and Anti-rotting Terylene. Dual Closure Entry with Zipper and Buckles Specification: Fits: 14' Trampoline with 6 W legs or 6 Poles Enclosure. Netting Size: 14' Dia. Important: Please measure the outer diameter of your trampoline frame across the middle for the best match prior to purchasing. This is net only, the poles for enclosure is not included. 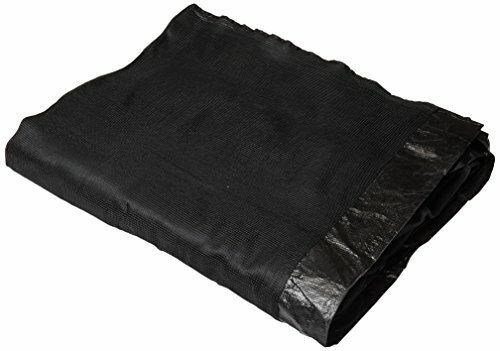 Package Content: 1 x Trampoline Outer Netting. If you have any questions about this product by Exacme, contact us by completing and submitting the form below. If you are looking for a specif part number, please include it with your message.